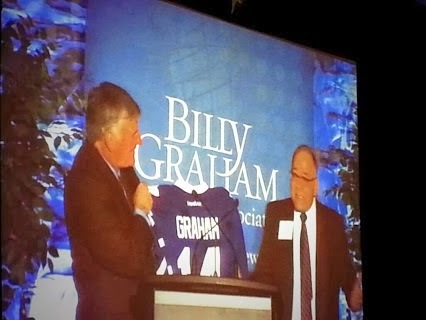 We had an intimate lunch yesterday with 800 people and Franklin Graham. There will be a mission in Toronto in September and this was the luncheon to publicly launch the plan within the larger church community. We have a few folks on the leadership team and I’ve been the main contact for BGEA and THQ. The BGEA team excel in organization and remind me (at times) of the Disney style of leadership. They do everything well. It was great to hear Franklin Graham and to witness his increasingly mature and polished leadership. He has really mastered communicating to a room and while he is not his father he certainly has many of his skills. Speaking of his father, Franklin talked about Billy and indicated that his health is not well and it is not likely that he will be with us much longer. However we did pray for his health and for their family. They presented Franklin with a Leaf’s jersey – with his name on it and number 14 to symbolize the 2014 mission.